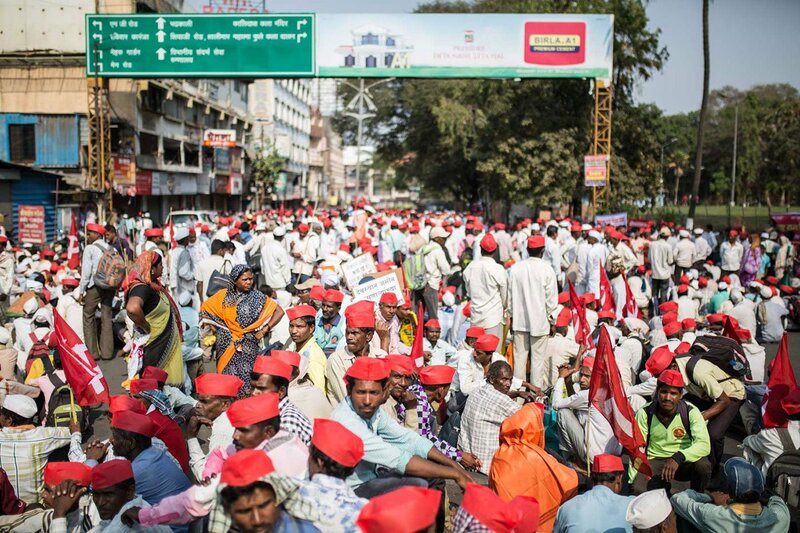 Protesting farmers are planning to encircle the assembly and press for demands they feel the government has betrayed them on: crop prices, a loan waiver, forest rights, procurement and more. Shankar Waghere flings his plastic bag on the ground and hunches over on his wooden cane to gather his breath. Then he kneels down, panting, and closes his eyes. They remain shut for the next 15 minutes. It’s been a lot of walking today for this 65-year old. Around him, in the darkness, are some 25,000 other farmers. 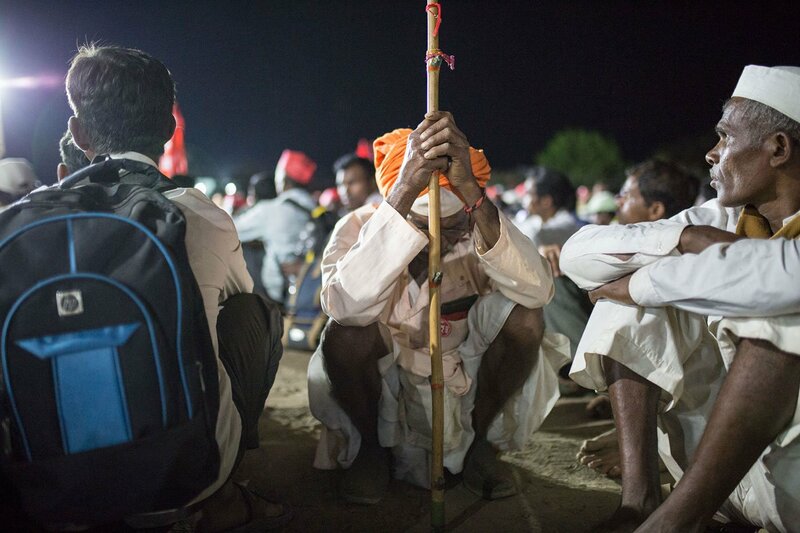 “We have to fight for our rights,” he says, sitting on the Nashik-Agra highway in Igatpuri’s Raigadnagar locality. 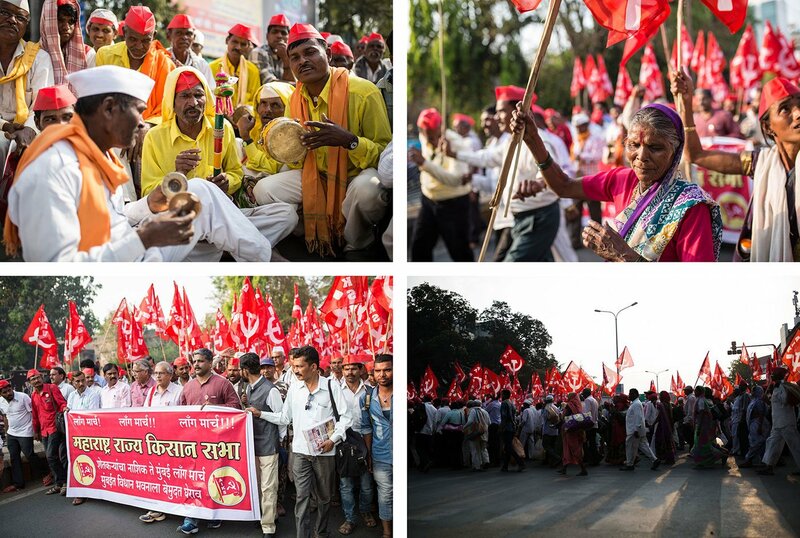 It is the first halt of a massive farmers’ morcha that began in Nashik town on March 6, on a busy Tuesday afternoon. 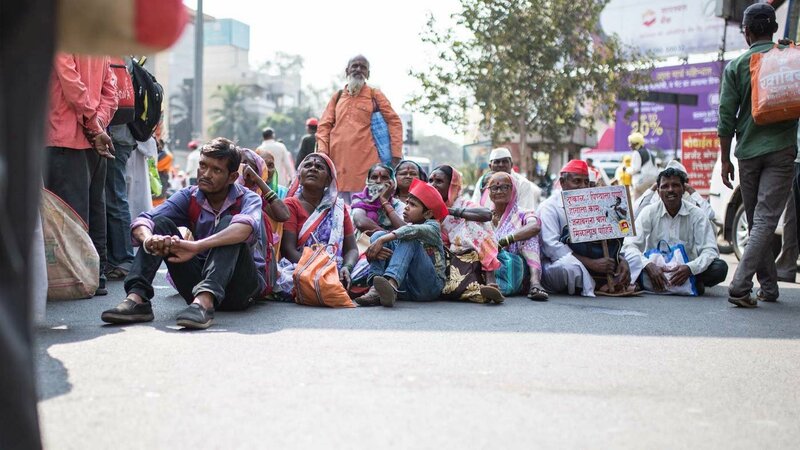 The farmers plan to reach Mumbai on Sunday, March 11, and encircle the legislative assembly building the day after – to protest against the state government’s failure to fulfil its promises. 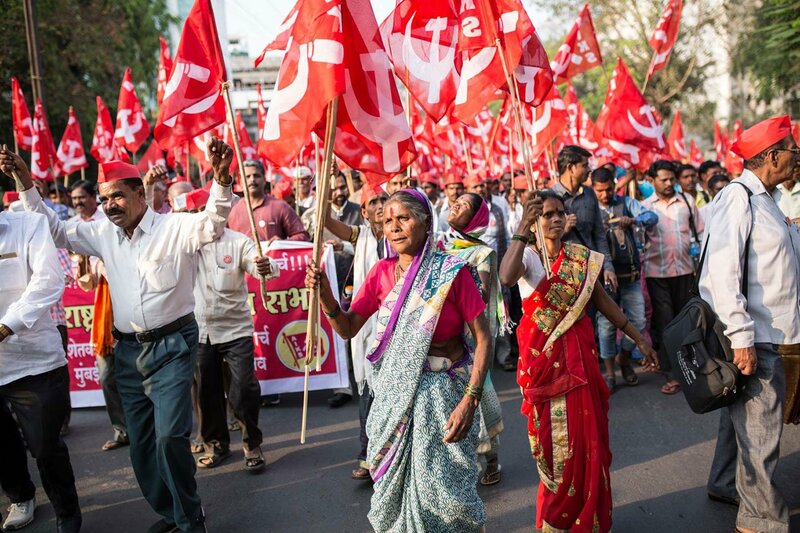 As the march moves along, more farmers from across Maharashtra – from Marathwada, Raigad, Vidarbha and other districts – are expected to join and the numbers are likely to multiply by the time the morcha reaches Mumbai, 170 km from its starting point. For now, most of the farmers already on the move are from Nashik district and nearby areas, many of them from Adivasi communities. 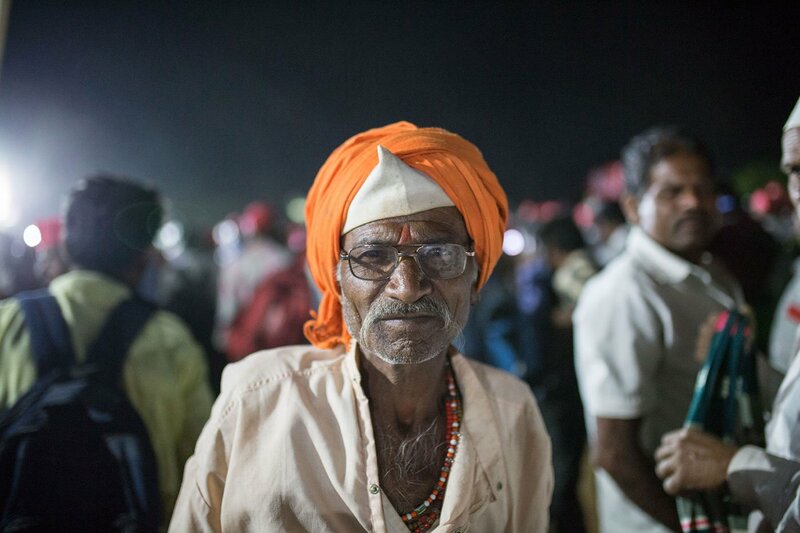 Waghere, from the Koli Mahadev community, has come from Nalegaon village in Dindori taluka of Nashik. Earlier in the day, he reached CBS Chowk in Nashik – 28 km from Nalegaon – by foot. The long walk to Mumbai began from this chowk later that afternoon. When I reach CBS Chowk at 1 pm, the crowd is still sparse, waiting. Gradually, jeeps full of farmers start pouring in, filling up the entire street with a sea of red CPI(M) flags and caps. Some of the men have wrapped handkerchiefs around their foreheads, the women have covered their heads with saris as shields against the hot sun. Most of the people here are carrying plastic bags or shoulder bags containing clothes, and wheat, rice, bajra and a few other food grains to last for the week-long march. By 2:30 pm, the men and women dip into their bags and bring out chapatis and sabzi wrapped in newspapers. They sit on the road to eat their lunch. Nearby, other Adivasi farmers are singing traditional folk songs to pass the time. Balu Pawar, Vishnu Pawar and Yevaji Pithe, all from Pangarne village in Surgana taluka of Nashik district, are putting on a show. Sitting on the divider of the street, which has now been cordoned off by the police, Balu is on a tuntuna, Vishnu is playing the dafli and Yevaji is in charge of the cymbals. “What are you signing?” I ask them. “It is a tribute to Khandaraya, our deity,” they say. While reporting from Marathwada for the past year, farmers have repeatedly talked to me about such issues as the enforcement of the Swaminathan Commission’s recommendations of a minimum support price, a blanket loan waiver, and reliable irrigation. For many in the crowd gathered in Nashik, these demands are important too, but among their main concerns is land rights. As the march progresses, the concerns of the farmers who join in will vary. By 3 pm, the organisers start addressing the crowds, and by 4 pm thousands of people start walking briskly through the streets towards the Nashik-Agra highway. At the forefront is 60-year-old Rukmabai Bendkule – dancing robustly with a red flag in hand. Rukmabai is a farm labourer from Dondegaon village in Dindori taluka. She earns Rs 200 a day working three days a week – six days on the road is a loss of at least a valuable Rs 600 for her. “Even though I do not cultivate any crops, if the farmers in my village lose their land [to the forest department], I lose work,” she says. But will the government budge, I ask her. “Do they have an option?” she smiles. On the way, many of the farmers refill their plastic bottles from a water tanker arranged by the organisers. 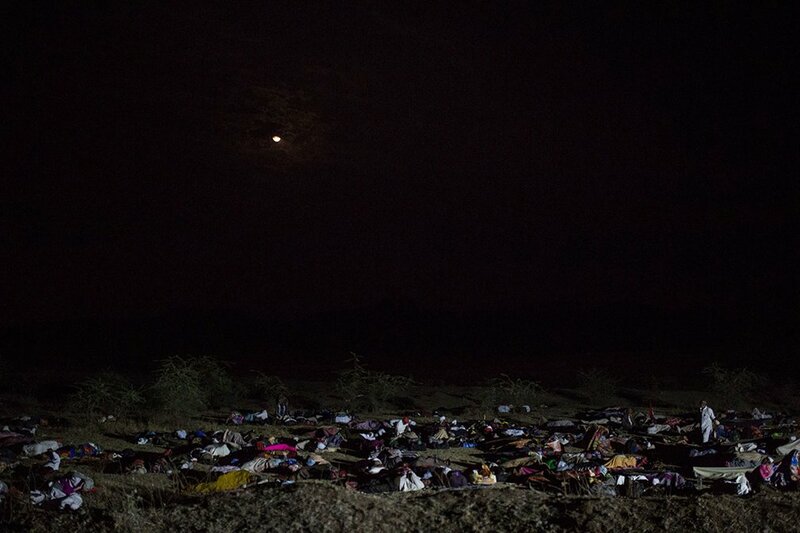 That’s the only break they take till they reach Raigadnagar – five hours later, around 9 pm – where they spend the night near the highway, not far from Waldevi dam, on open ground under the sky. 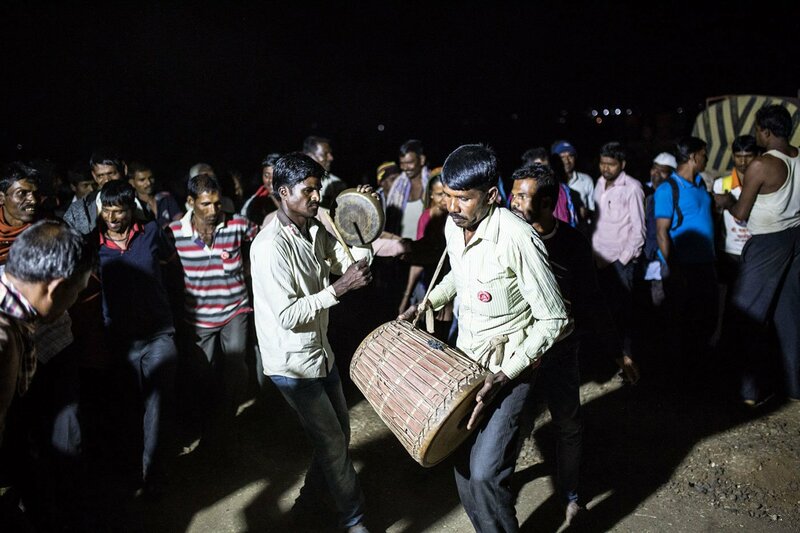 After dinner – also chapatis and a vegetable – which too they have carried in their bags, some of the farmers start playing music on speakers on a truck accompanying the morcha. Folk songs reverberate through the dark night and, hands behind each other’s back, several men form a semi-circle and dance to the music. Parth M.N. is a 2017 PARI Fellow. He is a special correspondent for India with the Los Angeles Times and freelances at various online portals. He loves cricket and travelling. This story was originally published on the People’s Archive of Rural India on March 8, 2018.